SSDs have become the portable storage device of choice here at HEXUS HQ, yet while the speed, noise and size benefits are obvious to see, there's still merit to external hard disks if cost and capacity are the most pressing concerns. It's easy to pick up a spacious 4TB external hard disk for under £100, and advances in drive technology are such that 8TB models are now plying the premium end of the market. 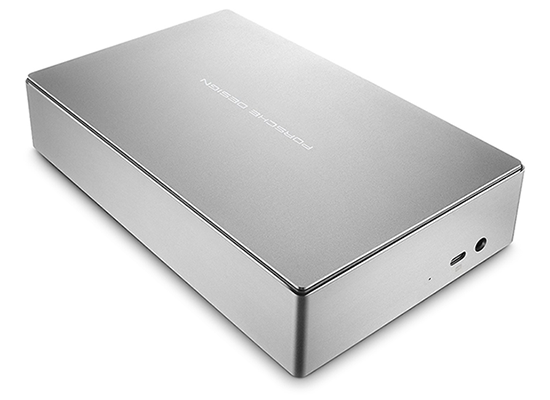 We've already seen an innovative solution from Seagate requiring only a single USB Type-C cable and we're now turning our attention to LaCie, whose Porsche Design Desktop Drive offers a greater sense of style to those who crave such things. Available in 4TB (£165), 5TB (£215) and 8TB (£290) capacities, the drive claims to offer "forward-thinking technology from LaCie with immaculate style from Porsche Design," though one suspects it's the latter that forms the bulk of the appeal. Measuring 123mm x 178mm x 39mm in size and tipping the scales at 1,225g, our 8TB review sample is neither particularly small nor light, however it does look fancy and makes for a stylish piece of desktop decoration. Whereas most external hard disks are staid affairs, the Porsche Design Desktop Drive employs an aluminium enclosure with polished edges, rounded corners and a sandblasted finish that feels as good as it looks. Four rubber feet keep the unit firmly planted, and there's little to disturb the drive's sleek exterior lines, with only a Porsche Design logo across the top and a small LaCie badge on the side. 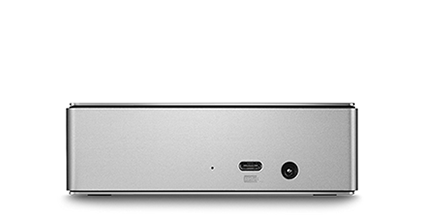 Both I/O ports are positioned at one end, alongside a small activity LED, and LaCie keeps things modern with a USB 3.1 Type-C connector. The bundle includes a Type-C to Type-A cable to help preserve compatibility with older PCs, but unlike the Seagate Innov8 there's no hi-tech internal battery, meaning mains power is required. 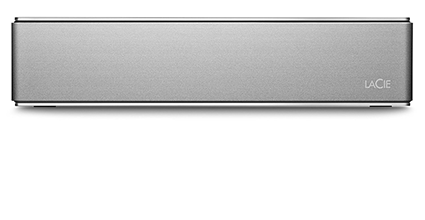 LaCie's small power adapter inevitably takes away some of the appeal. The supply isn't particularly big, yet it's another thing to carry and, on a device that emphasises form, having two wires jutting out the back is less elegant than having a single cable handling both power and data. If we're being picky, we'd also have liked the activity LED on the opposite end from the ports, and a power switch wouldn't have gone amiss. 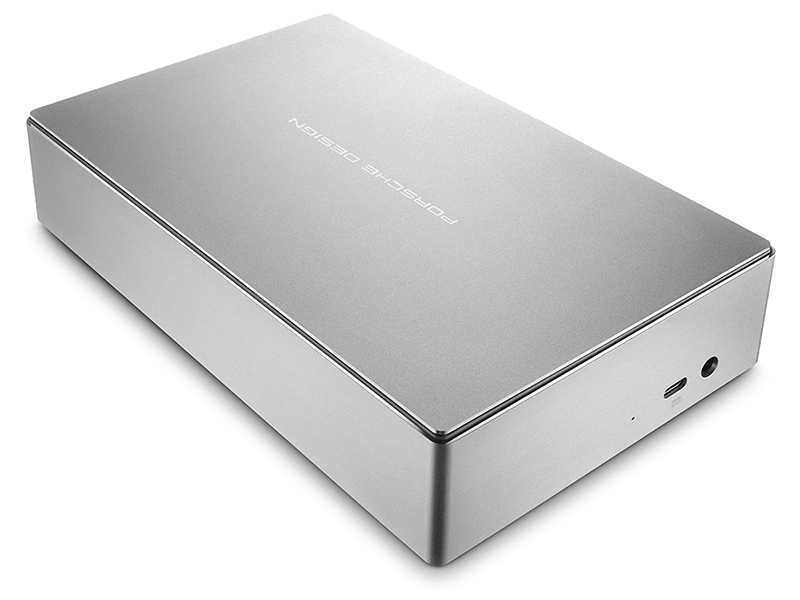 On the plus side, the use of mains power supply does have a benefit - attach the drive to a USB Type-C-enabled laptop and the Porsche Design Desktop Drive will have sufficient juice to power while simultaneously delivering up to 30W of charge to the laptop. A handy feature to have, particularly if you happen to use an ultra-thin laptop that's short on ports. You might expect a few useful software utilities as part of the £290 fee, but the bundle is surprisingly simple. Our UK-spec review sample came pre-loaded with just the two pieces of software; LaCie Desktop Manager (pictured above); and Genie Timeline Free. The latter is an ad-based backup utility that's available to anyone as a free download, while the former offers little in terms of functionality. 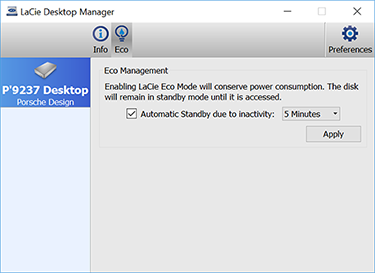 Desktop Manager does show the amount of used space, and there's an option to enable automatic standby, but there's nothing else of note. 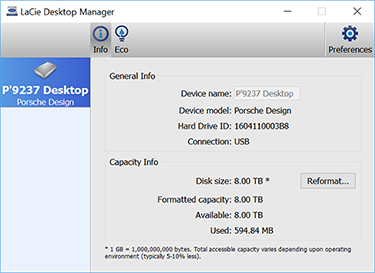 As a sign of the software's simplicity, hitting the 'reformat' button merely opens Windows' Disk Management utility. 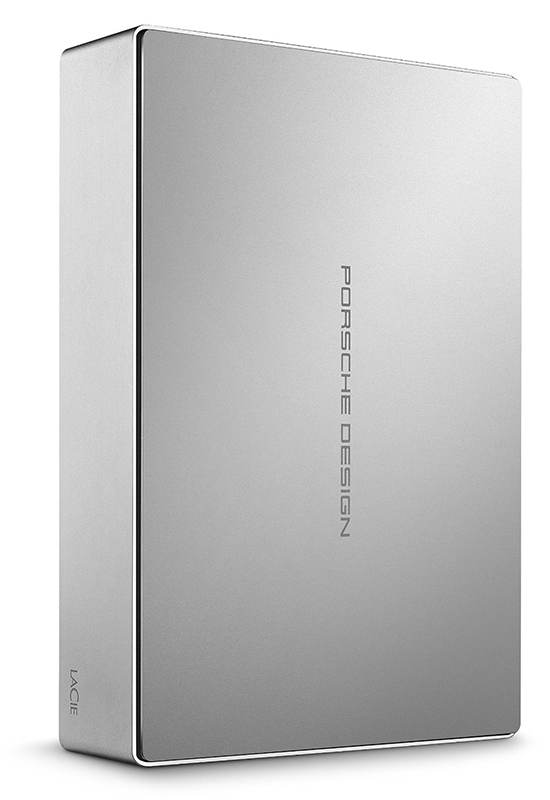 Backed by a standard two-year warranty, the 8TB Desktop Drive's appeal is intrinsically tied to the aesthetics of the Porsche Design enclosure. Question is, how does it fare with regards to transfer speeds and noise?